A high school student walked into a lab…. Sounds like the beginning of a joke, but discovering your calling in life—the one career you know will make you happy—is no joke, and that’s what happened the day Taylor Cooperider walked into her high school Biology II lab. Taylor had worried a little about this particular lab. The task that day was dissecting a cat, and Taylor loves cats. It didn’t sound like much fun. But once Taylor had a chance to look at the cat’s anatomy and see how the heart and liver and everything else inside the cat worked together, she became enthralled. 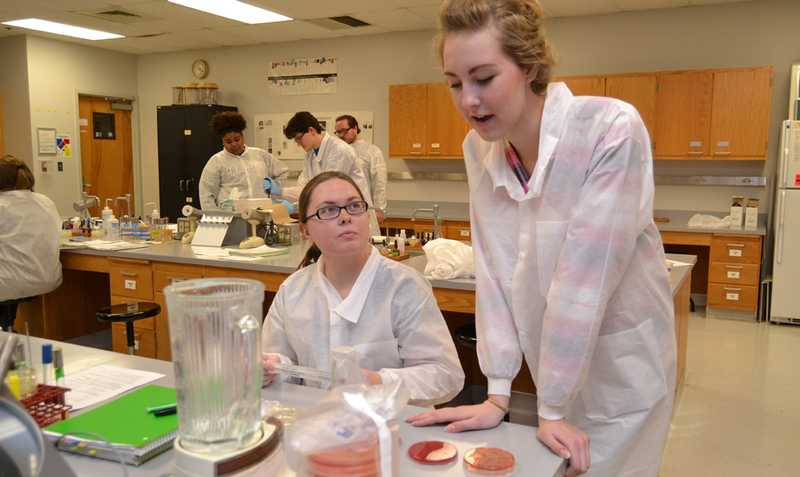 In fact, it was during that lab that Taylor discovered laboratory science would become her career. “I love the lab!” Taylor says. Taylor had decided to work in a lab, but she still had no idea exactly what kind of work she would do. A CLS major becomes a highly skilled lab scientist who analyzes samples to detect the presence or absence of disease, producing results that help doctors know how best to treat patients. That’s it, Taylor decided, and she found a list of colleges that offered a CLS major. And there it was—UIS in Springfield, Illinois. Taylor’s decision to attend UIS was made easier because she is the fifth member of her family to attend UIS. Taylor’s stepmother, Jacki Cooperider, graduated in 2006 with a Master’s in Business Administration; she works for the EPA as a chemical engineer. Taylor’s father, Adam Cooperider, graduated in 2007 with a Business Administration degree; he works at Horace Mann. Cousin Corey Cooperider, graduated in 2014 with a major in Criminal Justice; he’s serving in the Army military police. Another cousin, Devon Cooperider, is currently at UIS, majoring in history. And Taylor herself will graduate in 2018. But having decided where to go for college, a much bigger, more challenging question remained…. How would Taylor pay for college? Taylor’s parents told her they would help with the cost of college as long as Taylor got good grades and treated school as her job, but Taylor knew it was very important that she do as much as possible to keep their contribution low. Attending UIS meant she could live with her father and stepmother and that would cut down on costs. Unfortunately, working hours and hours while attending college wasn’t an option, not with a CLS major. Given the demanding nature of a CLS degree, Taylor knew she would need to focus instead on academics—especially during her junior and senior years when she began taking mostly CLS classes and had to spend long hours getting clinical experience. “Even a part-time job is not recommended,” Taylor says. She hated the thought of loans, and so Taylor applied for and received scholarships, even while in high school. Based on her high school GPA and her ACT scores, she also qualified for the Lincoln Merit Scholarship at UIS. As a freshman, Taylor received the Edith B. Terril Memorial Scholarship, funded by Joe Terril, a St. Louis businessman who earned a BA from UIS (then Sangamon State University) in Economics. This scholarship honors Mr. Terril’s mother. She also received the Health Professions Scholarship her first year, established by a grant from the Central Illinois Consortium for Health Manpower Education. 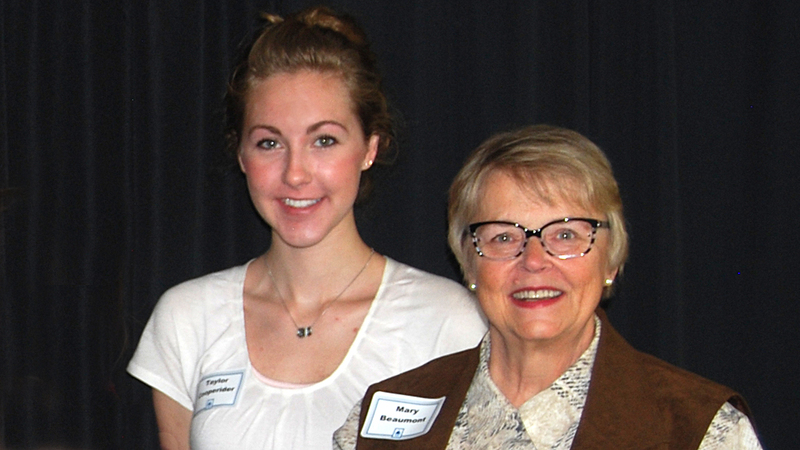 The scholarship Taylor received this year honors Mary Beaumont, a leader in the Springfield chapter of the American Association of University Women who has been active in the Springfield community both professionally and as a volunteer. One of Mary’s initiatives during her tenure as president of the AAUW was an “Expand Your Horizons” conference encouraging middle school girls to study math, science and technology. How appropriate that Taylor, a science major, has received Mary’s scholarship! Taylor Cooperider and Mary Beaumont at the 2015 Scholarship Luncheon. There’s little doubt Taylor will get a job after graduation. One of the most under-recognized health professions, CLS is nevertheless vital to our health system, and the profession is growing. The US Bureau of Labor Statistics reports that CLS is anticipated to have a 22% increase in employment from now until 2022. The job placement of UIS grads is particularly good— 100% over the last three years. What a great decision Taylor made that day in her Biology II lab. Even better, thanks to her own hard work, her parents’ help and scholarship donors like Joe Terril and the Springfield AAUW, when Taylor walks into a lab on her first day as a professional, she will do so debt free. A bright future indeed!